Darlie rejected the State’s offer of a life sentence after her conviction. July 2015. CNN’s Death Row Stories aired an episode on the Routier case. Stephen Cooper and Kathy Cruz, a former newspaper reporter, were among those interviewed for the program. Susan Sarandon narrated. Sarandon: Cooper felt confident that the flawed transcript could earn a new trial for Darlie…this drew concern from prosecutors. Cruz: When all of this came to light, the State offered her a life sentence. All she would have to do is basically admit that she’d killed her children. Sarandon: And what did she say? September 2015. 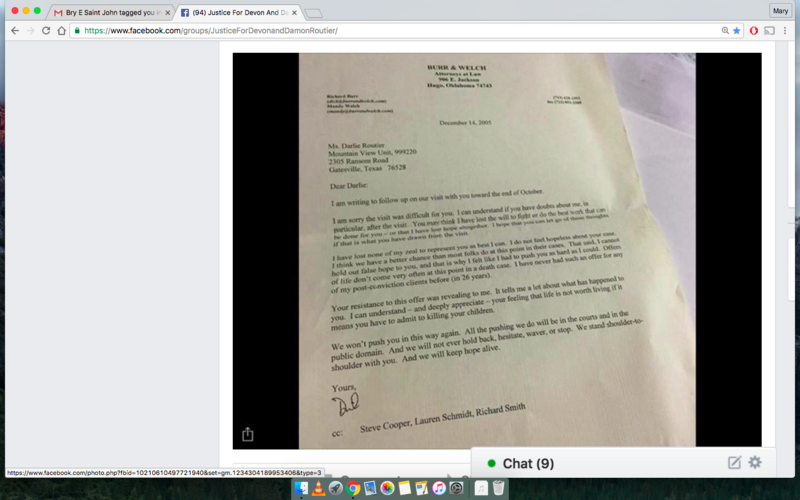 The screenshot of a 2005 letter from Richard Burr to Darlie was posted online. Supporters vehemently insist that this letter is proof that the State offered Darlie a deal. Cruz went even further, implying that an offer was made because the State feared a new trial might result from the transcript issue. This issue, however, was resolved in the State’s favor a year and a half before the letter was even written. Offers of life don’t come very often at this point in a death case. I have never had such an offer for any of my post-conviction clients before (in 26 years). Burr does not say that Darlie was offered life. He says that he has never received such an offer in 26 years. The reason that he – or any Texas attorney, for that matter – has never received an offer is because life without parole was not even an option until June 2005. You may think I have lost the will to fight…or that I have lost hope altogether…that said, I cannot hold out false hope to you. This certainly doesn’t sound like Darlie had a good shot at winning a new trial. On the contrary, the overall tone is one of sadness and despair. Pamela, our office did not offer Darlie Routier a life sentence in exchange for a confession from her. The transcript issue was put to bed long ago. As you noted, the Supreme Court denied certiorari review from the direct appeal back in 2004. It seems too much of a coincidence that Burr’s letter – assuming it is legitimate – was written shortly after the life without parole bill was signed into law. Although it’s not retroactive, we all know that laws are not permanently etched in stone. Exceptions are sometimes made and sentences commuted. Richard Burr, feeling the time was right, may have broached the subject with Darlie. On the other hand, it’s extremely odd that this letter was kept under wraps for ten years. If it casts Darlie in a warm glow – or in Cooper’s words as ” strong, brave, and innocent” – then why not release it in 2005? Much like the polygraph and regression therapy, favorable results would have been publicly announced a long, long time ago.